Ian has grown a beard and started wearing chunky jumpers - OK not really but he has been to a folk concert and here's what he had to say about it. 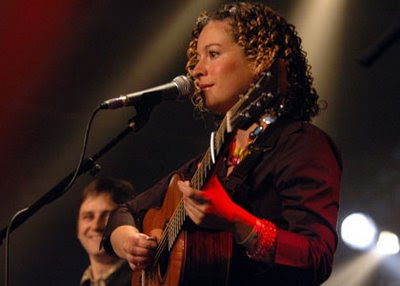 If I was a god fearing creationist and my time had come to enter the nirvana based afterlife, I would expect ALL angels to look and sing like Kate Rusby. There were a few "firsts" for me last night - the first time I had seen English Folk music's hottest ticket, my first visit to The Glasgow Royal Concert Hall and my first hands-on visit to Celtic Connections. Celtic Connections is a clever festival - still expanding year on year, it has blossomed from a celebration of traditional Celtic music to embrace contemporary and traditional folk, world, roots and allow musicians from other genres to come along and try their hand in a friendly environment. The scandal a few years back was Billy Bragg playing under the "Scottish granny" rule however attitudes have progressed and it is an all embracing two weeks of all that is good about music. Also, it is also a superb way to brighten up the slowest month of the year. The love affair between Celtic Connections and Kate Rusby grows year on year and an expected sell out audience were thrilled to welcome Kate on the back of a great 2008 album and a collection of Christmas traditional folk songs released in December which certainly went down well in our house as an alternative to Nat King Cole. None of the latter were played however with such an extensive back catalogue to choose from there was as Kate said "A lot to get through". Rusby's songs are a paradox - she is relaxed, cheerful and friendly on stage, her voice a bittersweet overture backed by some fine musicians however the tracks are black. This one is about a bitter man. Here's one where the hero gets stabbed at the end. This song is about a woman who drapes herself over her lovers grave. All very Nick Cave! But it's not down, it's a happy night brightened further with banter about craft fairs, cooking and stories about her dog. Plenty of thought was given to the arrangements and as well as a quality four piece backing band, Kate called at times on a ten strong string section ( called red skies) and a variety of passing folk worthies which emphasises the close knit community feeling that Celtic Connections boasts. This is where the venue came into its own - at one stage with 16 musicians on stage (it reminded me of a Red Wedge collective) nothing was lost musically and in spite of her petite stature, Kate Rusby always looked perfectly in control. Kate Rusby's relaxed attitude made it appear that she was playing to friends and the vibe was that this was an annual pilgrimage for many - for those of us who were new it certainly made us want to hear more and to get involved in other parts of the local folk scene. Talking of which, support came from the excellent Kris Drever who has a growing reputation locally and showcased a cross section of traditional and contemporary numbers with a couple of guests joining him throughout the set. Drever enjoyed the big occasion and left a good impression. I'll be trying to catch him again soon as he tours with John McCusker, once of the The Battlefield Band and an acclaimed producer and Roddy Woomble, ex Idlewild front man as they bring roots and folk to a new audience.